Great for securing baits for distance casting, or lightly hooking baits for an instant strike. Perfect for using on solid frozen baits like Smelt/Mackeral etc. Saves the bait flying off on the initial cast. Can be used double for bigger baits. Also used for securing PVA bags of prebait. They start to loose their strength within 10 minutes and will release bait as soon as it moves.Average time during winter is around 10-15 minutes. Leaving your bait with the hooks in. 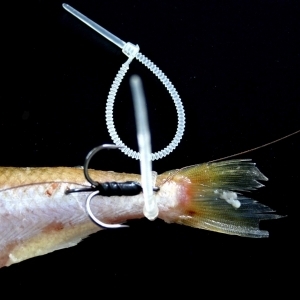 No need to bury your hooks into the tail root and aids for easy striking.